Meditation is a valuable tool that creates stillness in your mind, and helps you maintain and retain the clarity you need in your life, to making decisions that will help you live a legendary life. Referred to as a practice, meditation can be used daily and/or multiple times/day, to quiet the voices in your head, and keep you focused on what you want. Today’s podcast is dedicated to Brittany. 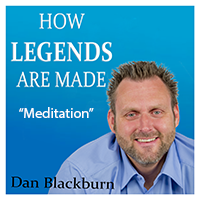 Listen in and learn how mediation can change how you develop and maintain your clarity about being a success.